This page contains a thorough introduction to the data structures used for the music library items. 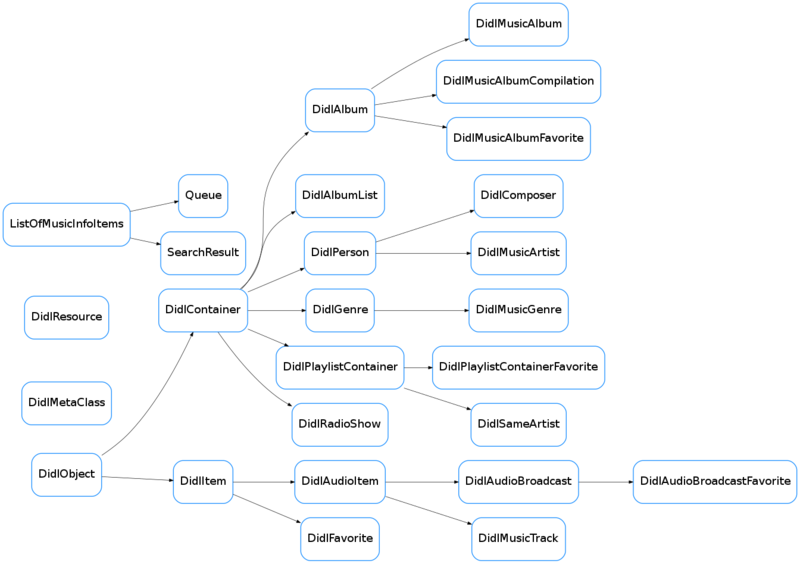 The data structures are implemented in the soco.data_structures module and they are used to represent the metadata for music items, such as music tracks, albums, genres and playlists. Many music related items have a lot of metadata in common. For example, a music track and an album may both have artist and title metadata. It is therefore possible and useful to derive a hierarchy of items, and to implement them as a class hierarchy. The hierarchy which Sonos has adopted is represented by the DIDL Lite xml schema (DIDL stands for ‘Digital Item Description Language’. For more details, see the UPnP specifications (PDF). In the data_structures module, each class represents a particular DIDL-Lite object and is illustrated in the figure below. The black lines are the lines of inheritance, going from left to right. Text of the first footnote.